The New York Times published a story regarding how common houseplants can purify the air of chemicals like benzene and formaldehyde. This claim is based on NASA research performed in the 1980s when the agency was trying to figure out ways to keep the air quality as clean as possible within enclosed habitats (like a space station). Of course, you can read the 27 page report... or read a mom-friendly book that summarizes the findings in an easy-to-understand language from Amazon.com. "How to Grow Fresh Air" by Dr. BC Wolverton. The book reviews 50 common houseplants' ability to clean the air inside the home or office. Depending on the plant, chemicals that can be removed include benzene, formaldehyde, xylene, toulene, trichlorethylene, chloroform, ammonia, acetone, and alcohols. Such chemicals are emitted from electronics, drywall, adhesives, upholstery, carpet, paint, cosmetics, etc. It is suspected that such chemicals may be the cause of "sick building syndrome" that induces symptoms of upper respiratory irritation, fatigue, headache, and congestion when afflicted individuals enter certain buildings. 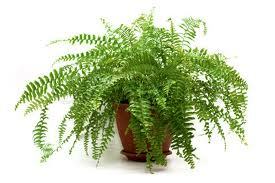 My personal favorite plants are the fern and peace lilly, both which have a high rate of chemical vapor removal, easy to grow and maintain, and fairly resistant to insect infestation. Does the job and easy to care for. Now before running to the nearest greenhouse and buying numerous plants to keep inside the home, consider that though such plants remove chemicals from the air, the plants themselves may exacerbate allergies in sensitive individuals. Why? Plants can increase dust (accumulated on the leaves) and mold allergens (in the soil).